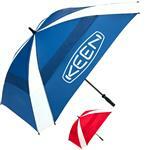 Slazenger Vented Folding Golf Umbrella with your logo. 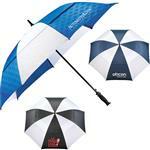 You will be trendy and dry on the golf course with this Slazenger Auto Open Folding Golf Umbrella! 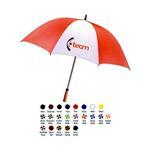 This sleek design is vented with a pongee canopy with trending three-color design! Features a Pongee carry case with shoulder strap which matches the color pop. A black rubberized handle for easy holding during rainy/damp conditions, is printed with the Slazenger logo in matching color-pop. Safety tips include folding to 21” long. Available for 24 Hour Production! Available Imprint Options: Silkscreen, Multi Color Options Available- Inquire for Pricing!